Celebrating the official opening of ITA’s U.S. and Foreign Commercial Service Office in Wuhan, China, on February 3, 2015, are (left to right): Sara Kemp, Minister Counselor of Commercial Affairs, U.S. Embassy, Beijing; Patrick Santillo, ITA’s Deputy Assistant Secretary for China; Mr. LI Zuoqing, Director General of the Wuhan Department of Commerce & Deputy Secretary General of Wuhan Municipal Government; Joseph Zadrozny, Consular General, U.S. Consulate Wuhan; and James Rigassio, Principal Commercial Officer, U.S. Consulate Guangzhou. April 17 has become an important date for the U.S. and Foreign Commercial Service in China, specifically the teams at the U.S. Consulate in Guangzhou and Wuhan. It was just a year ago – on April 17 – that U.S. Secretary of Commerce Penny Pritzker laid out the commercial and economic details of the Obama administration’s rebalance to the Asia-Pacific region. Secretary Pritzker acknowledged the work of ITA’s Foreign Commercial Service, and announced that as part of the Department’s emphasis on this critical region, new Commercial Service (CS) offices would be opened in Wuhan, China, and Rangoon, Burma. With the challenge set, the U.S. Commercial Service in Guangzhou (CS Guangzhou) took the lead to open a new Commerce Department office in Wuhan (CS Wuhan). By August 2014, the first Commerce local national was in place. By February 2015, the second local staff member was in place – temporarily based in Guangzhou. By mid-2016, the first Principal Commercial Officer will arrive at the post. Organized a series of SelectUSA seminars in both Hunan and Hubei provinces to meet with potential investors and to promote investment in the United States. Recruited a delegation of central China companies that attended the 2015 SelectUSA Investment Summit in March. Hosted representatives from 10 California colleges and universities to meet with local education authorities and schools, and deliver information about their programs to local parents and students. 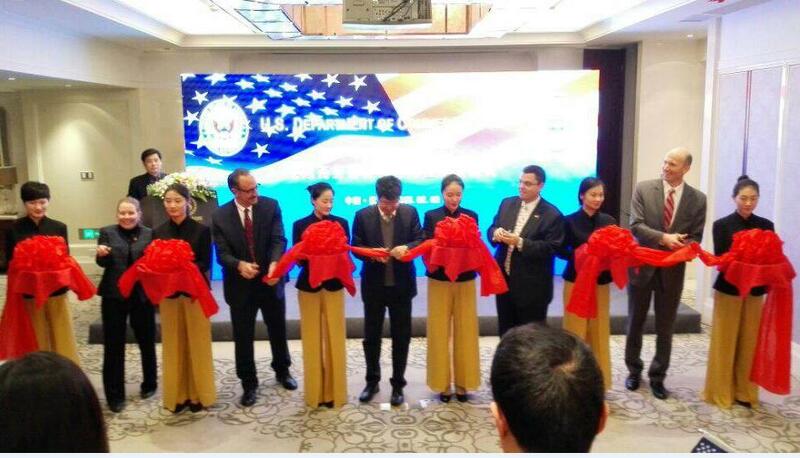 Arranged a series of road shows in Hunan and Hubei to promote the United States as a tourism destination. The team continues to work with China South Airline and Dynamic Airways to promote a direct flight from central China to the United States. Fast forward one year – April 17, 2015. On this day, Secretary Pritzker was on the ground in Guangzhou, China, directly helping U.S. companies explore business opportunities with this critical trading partner. CS Guangzhou hosted the last stop on the Smart Cities – Smart Growth Trade Mission jointly led by Pritzker and Deputy Secretary of Energy Elizabeth Sherwood-Randall. The CS Guangzhou and CS Wuhan teams planned a full-day of meetings and events with key government and private-sector leaders from six south and central China regions for Pritzker and her delegation of 24 U.S. companies. Throughout the day, Secretary Pritzker learned about the south China region’s commitment to clean energy and reversing the impact of climate change. She introduced the U.S. companies to provincial and municipal government officials, initiating a process that could result in the companies exporting their world-class goods and services to the region. The Secretary also witnessed a signing ceremony for a trade mission participant to sell its natural gas engines to the major public transportation company in Guangzhou. In addition, she celebrated the announcement of a $700 million investment from a Chinese mining company into Nevada that will create 1,200 jobs. By the end of the mission, early successes were reported and critical introductions were made. CS Guangzhou and Wuhan have spent the past year operationalizing the commitment Secretary Pritzker and President Obama made to U.S. companies eager to do more business in the Asia-Pacific region. And these teams are just getting started.